It's not hard to see why TurboTax is the most popular tax preparation software on the market. It's easy on the eyes, very simple to use, and —if this is possible— makes your annual trip to the taxman almost seem like fun. 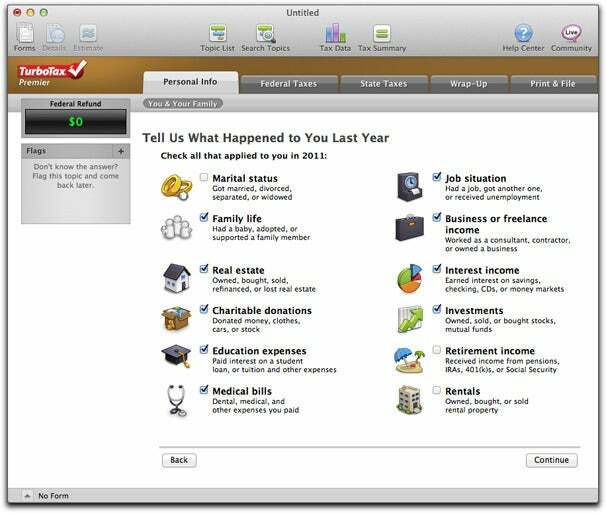 As is the case with H&R Block At Home ( ), TurboTax 2011 (we reviewed the Premiere version) runs you through a standard set of questions in what the application refers to as an "interview" process. These questions start with the basics—your name, address, social security number, spouse and dependent details. This information can also be imported from a prior year's tax return created using TurboTax or from PDF files created using H&R Block at Home and TaxACT. As was the case with H&R Block at Home, TurboTax was unable to import the data from the PDF file created from a professionally prepared tax return, and it was also unable to automatically import any of my W-2 data. The next step in the TurboTax interview process walks you through questions about any personal and financial changes that may have taken place during the past year that may result in changes to your tax status. Did you receive unemployment? Find a new job? Start a business? Get married? Divorced? Have a child? Send one off to college? Have one fly the nest? Buy a house? Sell a house? Using a series of checkboxes, TurboTax takes a quick inventory of what took place during the year and determines the specific tax-related questions it needs to ask as you work on your return. Annual Checkup: TurboTax's initial questionnaire helps the program to determine the more detailed questions it needs to ask to nail down the tax forms you'll need to file. TurboTax offers clear instruction on how to handle unique situations that may have tax implications. For example, if you had a parent move in with you during the course of the year, TurboTax can help you determine whether or not that parent can be considered a dependent. But, in the event that the answers provided within the application aren't as clear as you'd like them to be, Intuit offers free tax advice from "highly qualified advisors" to all TurboTax customers. (This includes customers using the free iOS version of the app.) Some of this tax advice comes via Intuit's Live community, but includes advice from tax professionals many of whom, Intuit states, have worked for the IRS. For the less trepidatious, TurboTax offers the option of forgoing the interview process to manually enter data in each form. While not something I would choose to do, I do have friends who prefer this method of tax preparation because they feel that it gives them more control over the process. For the curious, every portion of the interview process associated with an IRS or state tax form offers you the opportunity to view both the interview form and the actual tax form simultaneously. Once you run through the entire interview process TurboTax analyzes your return for accuracy, verifies that you have completed all your forms, and scans your return to determine whether or not it is likely to be flagged for an audit. While Intuit makes no guarantees as to whether or not you will be audited, TurboTax's Audit Risk Meter highlights items that may be of concern and offers you advice on how you should handle specific situations. For example, while my return had a low audit risk, the fact that my wife, daughter, and I all took college classes during the course of the year resulted in a reminder to double check and make sure that I had entered information about those courses correctly, verifying, for example, that no one had taken the college credit for more than the 4 years allowed by the IRS. TurboTax Premier is an excellent application that makes the prospect of preparing your own taxes easy and worry free. Clear instruction, simple data entry, and confidence-inspiring audit checks make TurboTax the perfect choice for filing you annual tax return.